Fabulous Ski/Snowboard trip This condo lived up to its description in every way. The great room (kitchen, dining area, & living area all together) was wonderful, and the beds and bathrooms were great as well. I would highly recommend this condo to anybody who was looking for a place to stay with five or less people. We had five people and absolutely loved it! Ski get away We have been to Brian Head several years and always explored different types accommodating hotels, resorts ect., this time we struck gold! This place was awesome! The ONLY hiccup was the last night when someone was up stairs settling in well past midnight. They were quite finally around 1 AM. The other two days were very peaceful and was able to relax. Wonderful condo and would go back again! Great condo!! Wonderful condo at a great price! We stayed over the 4th and had a great time! It was very clean and had everything we needed! We loved it so much we are going back! Luxury Accommodations at Budget Prices The Aloha Bear was perfect for our weekend getaway. It was priced competitively with the much older units at Brian Head, but came with all of the perks of a brand new, upscale complex. Surprisingly high end appliances and a well-stocked kitchen (key for those with families who like to save money by dining in). Much more (and nicer) than the typical service for four you find at many vacation rentals. Beds (especially master) were top notch, including pillows and linens. Decor was thoughtful, appropriate, and not overly cabin-ish. Modern furniture, while still keeping with the mountain feel. WiFi was a definite bonus. Great location - walkable to Giant Steps (though not ski in/ski out, which may be preferred by some). Very quiet complex. Obviously habited, but not a peep heard from our neighbors. Seemed to be a lot of owner occupied units (open garage doors showed evidence of permanent residents), which made for friendly and knowledgeable neighbors. Be sure to read the house rules and tips & tricks, as they contain some very useful information. Owner was very responsive and available during our reservation process. Thankfully, we didnt have the need to contact her during our stay, though we had several forms of contact provided. Aloha bear Excellent condo completely and fully stocked kitchen and modern comfort and convenience. Wonderful place to stay in Hanalei Loved the high end finishes in this place. Large and airy kitchen, dining and living room area. Perfect for our family of 3. You could easily have 2 more people stay with a bonus loft room that has a full size bed. Washer and dryer was great to have. No air conditioning, but lots of fans throughout house, highly recommend keeping them running throughout the day, even when you are gone so the house isnt so hot at night. No views of the beach, but great views of mountains. Beach is only 1 1/2 blocks away. We drove to where shopping and beach parking was - easier for us to not have to lug everything to town. Perfect! Perfect! This is a perfect place to stay. Close to the beach, accommodations are great and the service is exceptional. They make everything very easy upon arrival. Property was clean, the amenities are great so you dont have to lug chairs, towels, boogie boards, or snorkeling gear. The outside shower is ideal. We went with a family of 4 in the summer, and the surf is right at the beach you walk to during that time. Literally a 3 minute walk. Perfect amount of room, floor plan is wide open and the pictures are exactly what you get. We will stay there again, for sure. Something for everyone! We enjoyed a week stay in this lovely home. It had everything we needed for 2 adults and 2 teens -- beach gear, kitchen supplies, good beds, even a few guidebooks. We walked to the beach and to town every day. The house is very clean and stylish -- we didnt even mind a day or two of rain. Our boys loved the loft and made it their own hangout place. The adults enjoyed the full kitchen and good chairs for reading. waiole This was a great property in a great location in Hanelei. It was a perfect size for our family of 5. It was very close to the beach and within a long walk to the heart of Hanelei. The view of the mountains from the kitchen is breathtaking. The property is exactly as described on the web page. Hanelei is a perfect community to stay in because it is very quiet, and very close to all of the beaches on the north shore. We would highly recommend this rental. Lovely stay in Hanalei Thanks for sharing this lovely home. All was great. Note, this property is on Kuhio Hwy, but despite this, was quiet, and never felt overly trafficked. But I live on a bus line in a larger metropolitan area, so my perception is perhaps skewed. We love Hanalei and its laidback style. Im not much for resorts, so this place is perfect. The section of beach closest to the house (short walking distance) has a big slope/undertow so is not recommended for swimming. This may change as the winter weather shifts the beach around, but we found it better to drive the very short distance (since we have a 3yo) to a different section of Hanalei Bay for beach access, which worked out just fine. This really is a lovely home! Very clean, comfortable, wonderful location! Our stay at the Waioli was all wed dreamed and more. It was very clean, comfortable, and the open floor plan and high ceilings made it feel spacious. The yards are also beautifully landscaped and maintained. (We very much enjoyed the young hen that visited the yard, and also the little geckos on the bush outside the kitchen window.) It has a beautiful view of the mountains and waterfalls from the kitchen window! Very convenient location. As stated, it is a short walk to the beach; and we enjoyed walks to restaurants, shops, farmers market, river kayak rentals, etc. in town. It was also easy to take day trips to many other beautiful sites from this location. It was our first trip to HI, and we feel that we hit the jackpot by choosing the Waioli and Hanalei, Kauai. We would definitely like to stay there again. Great 2 weeks at the Waioli House...March 24-April 7 2013. My wife and I enjoyed 14 days at the Waioli House. The ease of use and proximity to both town and beach was wonderful. The amenities were perfect and the house was very clean and more than adequately supplied for cooking and entertaining. 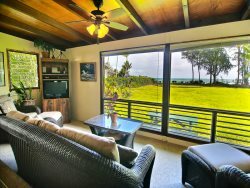 We highly recommend you stay at Waioli House when you visit Hanalei Bay area. Hanalei is the best Wow did we enjoy our stay in Hanalei and the island of Kauai. Our accommodation were wonderful, large and spacious for two couples. The patio was a great place to hang when it rained. It does rain in Hanalei. I guess you should expect that since it is so close to the rainiest spot on earth. Dont worry travel a couple miles and the weather is sunny. The sun can be as close as the beach which is just a short walk away.....really! That was nice. WaiOli is a duplex not a big problem but if you rent the unit on the right your bedroom window is just a few feet from the neighbors patio. They use their patio nightly and even normal conversation sounds very loud. Be advised they are talking with friends late into the night and that is most nights. I think they are the most popular people in Hanalei. My advice ask for the left unit or make friends with the neighbors as soon as you arrive. That way you can spend your evenings at their house drinking and enjoying the conversation. Owner Response: We have never had a comment about conversational noise from the neighboring house before. We were able to track down who your neighbors were at Aunty Lydias Ohana next door. A sister of the North Shore Irons family (of great world renowned surfing fame) was visiting and she had a lot of family to catch up with. Must have sounded like conversations you wanted to be part of, the surf lore of the North Shore? We absolutely loved The Hanalei. It was nice to be able to walk to the beach and to town. The house is very nicely appointed and very comfortable! Lovely stay in late March! We rented this house with our in-laws, and my husbands brother and wife. It is a great setup for multiple couples as each of the three bedrooms has its own bathroom (unheard of for a san franciscan!). Also a huge plus was the well-stocked beach closet with beach chairs and sand toys for our toddler. And dont forget the fantastic outdoor shower - it was perfect to rinse off sand and salt after a hard day at the beach. We really enjoyed the location, it was convenient to the little grocery store in town, but also to the gorgeous snorkeling beaches at the end of the road (tunnels, kee etc). Better than Advertised! Our stay at the Hanalei was a wonderful experience for all seven of us in the family. Our first thought when we first arrived was "Wow! This is even better than we had hoped!" Each person had a bed and there was plenty of bathroom space for all of us. The grandchildren loved their room and even shed tears when they had to leave "their Hawaii home". They also loved the geckos and the little frogs they found in the front yard. It was so relaxing to be able to wake up and have breakfast on our own schedule before setting out for the day. The house is just a short walk to the beach and we found lots of beach supplies to take with us. It was great working with Suzanne and her family from start to finish. Thanks for a wonderful stay! A Wonderful Surprise Upon booking the "Hanalei" I wasnt sure it would fit our needs and meet everyones expectations. Our family is 6 particular, opinionated adults and 1 infant. The picture on the website does not do the home any justice. The house is very spacious, has a big, well-equipped kitchen, lots of family space, including the lanai, great parking and great proximity to town. It is a very homey home, complete with beach chairs, mats, kids toys, and games, but it also had a luxury look and feel to it. We would definitely stay there again when traveling with the family. We will try a smaller unit next time for just 2 of us. Owner response: We really appreciate our guests taking the time to share their experience & say something nice. We are lucky in that we seem to attract very nice people. Aloha, Suzanne!